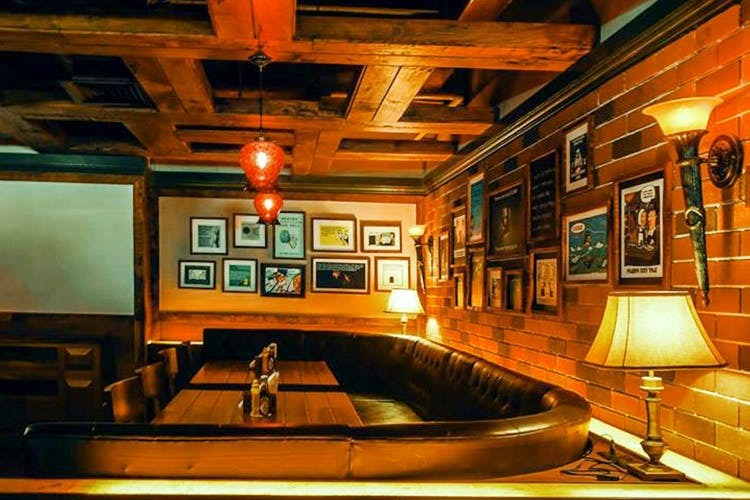 Fantom, Gurgaon's New Brewery, Doubles Up As A Bar Exchange! Golf Course Road just got another brewery because one can never have enough watering hole options. This one is rather stately with hardwood interiors, a bright, shiny bar and booths to seat plenty of beer lovers. Perch yourself on one of the bar stools and get ready to binge. Feel free to start with beer; since it’s a bar exchange, the prices fluctuate while you drink. Apart from mugs, pints and pitches of their house-brewed beer, they also have the staples like Hoegaarden and Stella. This principle of bar exchange applies to spirits as well, so you could score a couple of shots of Chivas or a bottle of Merlot for a steal. Expect the usual suspects when it comes to cocktails but if you are going to mix beer and vodka, we recommend the wheat beer to start and finish with! The food menu here is exhaustive, whether you’re a beer and wings person or a beer and biryani one. For starters, you can choose from Indian, European and Mediterranean, of which we remember the Chicken Shashlik for being as tender as tender gets. The Mutton Galouti and BBQ Pork Ribs came in a close second, though. The Fried Cheese Wontons, from the Munchies section of their menu, paired nicely with beer—but remember to save space for mains. For your main course, we suggest getting a a pizza or a slider platter if you’re full from all those appetisers. If not, try the Mutton Rogan Josh platter, Sliced Pork Belly or the Veg Dum Biryani which tastes as good as it smells. Eat, drink and make merry at Fantom – they also have a live DJ who does a pretty good job of spinning retro tunes over the weekend!